As the grandson of the alien princess Indigo, Jim (aka Kid Sensation) has always known that, technically, he's royalty. That said, he'd be the first to admit that he's never lived any kind of regal lifestyle - no titles, no castles, no crown jewels. However, the arrival of a courier from his grandmother's home world changes all of that in an instant. By royal edict, Jim is summoned home to the distant planet Caeles in order to claim an alien inheritance. Book Five in The Kid Sensation series is a great addition. "The Kid" is summoned to his alien grandmother's home planet, Caeles. Adventures abound as Jim arrival stirs up old rivalries and political intrigue runs amuck. 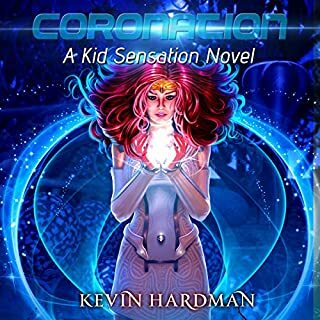 Coronation is a Young Adult novel, but it has a much wider appeal. There is a certain freshness to the series. You have a good feeling when listening to the books. The narration, by Mikael Naramore, is perfect. Like a good old-fashioned serial, Coronation, has a cliff hanger ending. We are set-up for the next exciting adventure in the Kid Sensation Series. I was given a free copy of this book for an unbiased review. 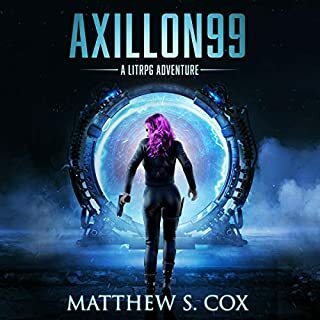 Trapped between murderous xenophobes and calculating artificial intelligences, an interstellar war threatens to wash Princess Kelsey Bandar away in a tide of blood. I love this space opera. The characters are likeable, smart, and brave. Princess Kelsey Bandar is the main protagonist in the story. She finds herself on an alien planet and also fighting the evil empire. Like most space operas, this one has a cliff hanger. I like it because I know there is at least one more installment in the Empire Of Bones Saga. 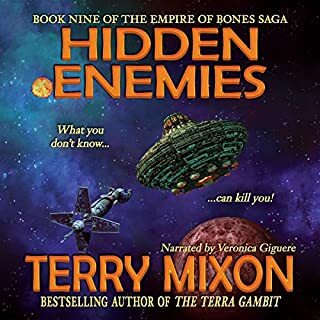 If you like rip roaring space adventures try Hidden Enemies. Listen to the series in order to enjoy the whole saga. As usual Veronica Giguere did a great job. She truly brings the story to life. I was given a free copy of this book for an honest review. Space Force is a book that get confused at times. I got the feeling it did not know if it was serious Science Fiction or a parody. Some of the gags are funny especially the political ones. The characters are likable, the bus driver was a riot. But overall I feel it missed the mark. 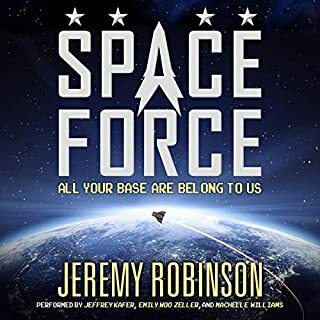 Jeremy Robinson's other books are much more to my taste. The narrators, Jeffrey Kafer, Emily Woo Zeller, and Machelle Williams helped elevate the story. I was given a free copy of the book for an unbiased review. Life in a post-apocalyptic city teeming with zombies isn't easy, but it can still be fun with the right friends by your side. Meet Eli Carter, delivery driver turned ghost hunter, and his Ghost Hackers team. This collection includes the first three books in the collection: The Cat Who Went Bump in the Night, The Ghost Who Wasn't There, and the The Dog Who Barked Fire. 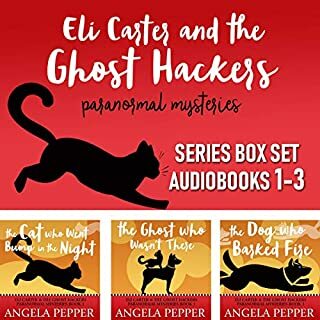 Complete Series: Eli Carter & The Ghost Hackers - Paranormal Mysteries Books 1-3 is a set of supernatural cozy mysteries, go figure. If you like to be scared this is not your book. If you like wacky, quirky characters I think you might like these stores. There is a touch of the paranormal, but only Chicken Little would be really scared. Plus, it is a great deal three stories for 1 credit. The narration was very good. I was given a free copy of this book at my request for an unbiased review. 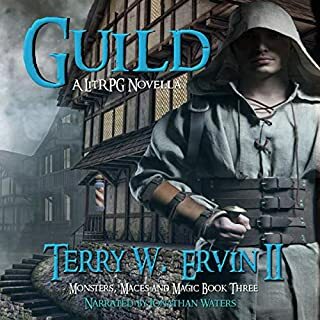 Eighteen years ago, Tom, a barber college student, got trapped in the Monsters, Maces and Magic game world as Josiah the thief. The first two adventures saw all of Tom’s party members, also trapped within the game world, perish within the fetid depths of the Dark Heart Swamp. His subsequent stint adventuring with NPCs proved short lived. He preferred survival. Over time, Tom became Josiah, adopting a life blending in with the game world’s NPCs. But life, even one lived as a faux NPC, can get interesting. This is a short novella set in the Monsters, Maces and Magic world. 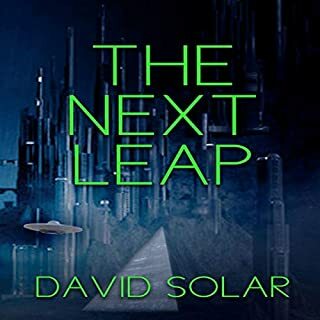 It is mostly a departure from the previous plot line so, strictly speaking, you do not need to read the other two books in the series to follow the story. However I believe it would help. James, another character from the "real" world", is introduced. He has been trapped in the game for eighteen years. The novella gives you a more in-depth look at the town, some of it's inhabitants and the current politics. Trouble is brewing. If you enjoy gaming or LitRPG stories I think you might like this one. Jonathan Waters made the book come alive. On the way home one day, 13-year-old Keith Croft stops at a neighbor’s yard sale and discovers a book for Crypts & Creepers that the lonely old woman says belonged to her granddaughter who disappeared without a trace. Days after he convinces his friends to try this bizarre game that doesn’t require electronics, strange noises in his closet wake him. His increasing inability to focus on anything other than a girl who vanished before he was born - and his obsession with her NPC ranger - drives him to dig deeper into the past, searching for what really happened to her. This is a YA roll play themed book (think Dungeons and Dragons). It is fun no matter what age you are. The characters are likeable and the plot is interesting. 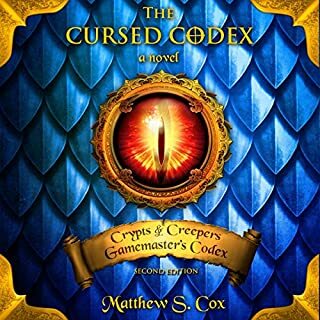 The "Crypts & Creepers" game book is cursed and a group of intrepid preteens decide to play. The kids get drawn into the game both literally and figuratively. There are real life problems facing the children, but they always rise to the situation. This is a fun relaxing listen for kids of all ages. The narrator, Matthew Cox, was great. The action in this book takes place in "the real world" and in the virtual world. In a lot of LitRPG once you get into the game everything else is forgotten. This book is exciting on both levels. A quest with a ten million dollar prize is at stake. The characters' personalities remain consistent in both universes. The good guys are both interesting and likeable. Even if you are not a gamer there is a lot to enjoy about this book. If you like a little science fiction with your action adventure stories I think you might like this. Avery Reid did a great job as narrator. I was given this book at my request for an unbiased review. When a ghost town is destroyed via quantum means, physicist Madison Martin is called in, but she's mystified. The weirdness intensifies when a ghost starts following her around. Things get more serious when a young man is murdered and an old quantum nemesis is back from the dead. 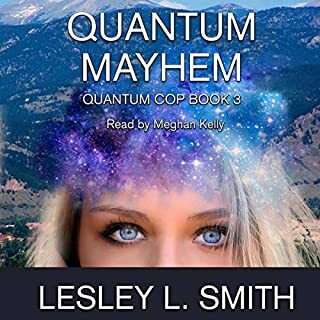 Madison resumes her role as the quantum cop to help the cops and the FBI investigate increasingly bizarre crimes including disappearing clothing and a demolished highway. The Quantum Cop is back. This is the third book in the series and I feel you should read the first two to understand the story. Madison, a Physics professor, is helping the cops and FBI solve more quantum crimes. This is a lighthearted book that has fun with the basic theme that people can bend time and space. Bad guys and good guys are popping in and out at all times and places. Madison does not take herself too seriously and has a wry outlook on life. This is a fun book with a novel plot idea. There is also a love interest or two (maybe three) to spice things up. Meghan Kelly portrays Madison perfectly. She put the right amount of snark and bewilderment in her voice to capture the essences of the characters. I was given this book at no charge for an honest review. 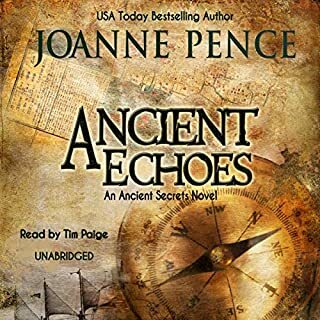 Ancient Secrets Series, Book 1 is a complicated book that combines history, archeology, alchemy, the paranormal, Lewis and Clark, Progeria, a major pharmaceutical company, and a whole lot of bad guys. At times the characters seem to run together and I had trouble keeping them straight. But, at times I really liked the book. The history was interesting and jetting from one country to the next was exciting. Having said that I think the book will appeal to a listener who likes paranormal adventure stories with a twist of history. Tim Paige was a great narrator. I was given this audio book for an unbiased review.